The Robin Hood stands proudly as Britain’s only charity pub: once they’ve paid their lovely staff and all of their not so lovely bills, the rest goes to charity. The Robin Hood is a friendly, warm and relaxed space, welcoming weary folk in for a plate of something comforting during the winter months, and pouring cool pints of the good stuff during the summer. They boast an impressive selection of board games, perfect for wiling away a weekend. 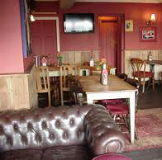 They’re also renowned for their hand made pizzas which are always available, as are great beers!